Get the TV Short Film: If you are a member of Netflix or Amazon Prime, you can watch the TV Short Film for FREE. Yep, who doesn’t love free? 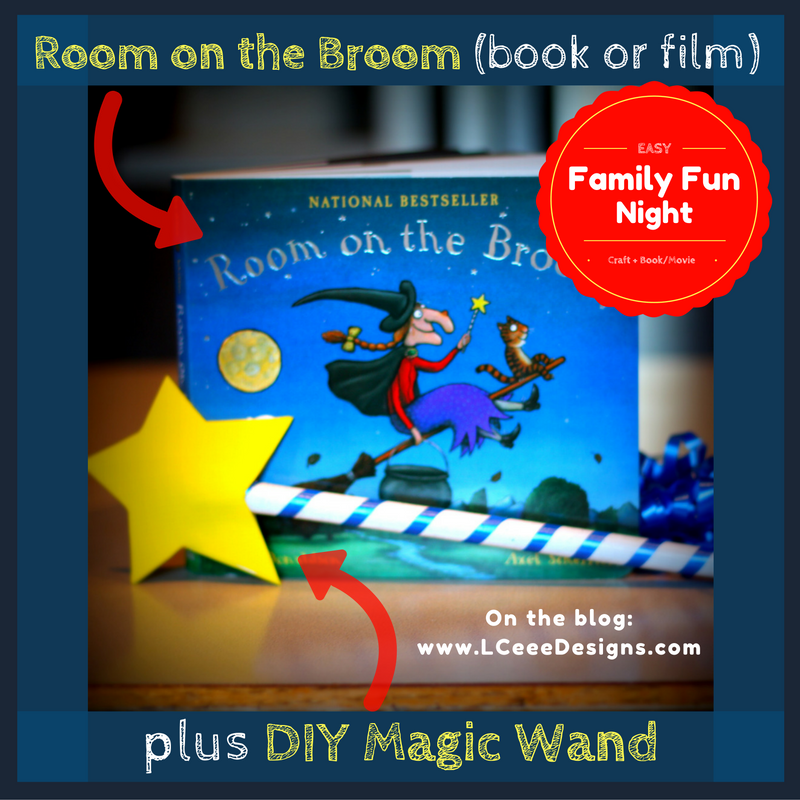 Just search for it on Netflix, or find it here on Amazon Prime: Room on the Broom. If you don’t have Amazon Prime, you can still rent or buy the TV Short on Amazon. The thing I love about the film being on Netflix and Prime is that it requires no pre-planning; it is available on a moment’s notice. Buy the Book: I am sure the local library has a copy of this great tale. But if they don’t, you can easily grab a copy on Amazon at a great price here. Of course, you may be missing some of these items, and that is OK. Improvise! For example, you could use a tightly rolled piece of white paper if you don’t have a pants hanger. Or, no ribbon? Pick a favorite colored marker and draw the swirl on the wand hand instead of using ribbon. This step is pretty straightforward. Remove the white part of the pants hanger and cut it down to the desired length. If you plan to do two wands, cut it in half. I decided to keep the handle longer since I wasn’t making a second wand. My handle was roughly 10 inches long. The next step is a bit trickier. The short version is that you want to wrap the ribbon around the white tube from the hanger, but do it in a way that the ribbon will stay put even after hours of holding by a toddler. Take the ribbon and place it near the top of the handle, tape it in place. Make a line of glue along the ribbon and wrap it around the handle. Keep gluing and wrapping until you reach the bottom. At the end of the tube, wrap the ribbon several times around itself and anchor it with tape. Depending on your child, this is a great time for them to help. They can use a Q-tip with glue and help put the glue onto the ribbon as you wrap it. Or, you can let them wrap the ribbon themselves. Either way, it will look awesome in the end. P.S. This step is the hardest and once it is finished, your wand is more than halfway done! Now that the handle is complete we need to add the star to the top. The next step is to take that yellow paper or yellow foam square and make a star. Draw a star on scratch paper, trace it onto the yellow paper/foam, then cut. You will want TWO stars the exact same size. If you want to let your kids be creative, consider giving them stickers (or maybe even markers and glitter) to decorate their stars for their wands! 5. Attach the stars & you’re done! Flatten the top end of the wand handle and tape it to the back of one star. Cover that star with a layer of glue, and also add glue to the back of the second star. Press them together with the wand in the middle. That is it. Family fun night made easy! Tell me, what are your favorite Halloween activities?